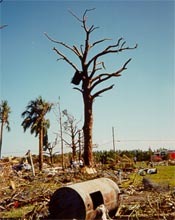 As you may be aware, portions of Seminole County and Oscelo County in the State of Florida were struck by a tornado on Sunday, February 22, 1998. Care Environmental Corp., a hazardous waste contractor for Seminole County, was retained to assist the county in removing the hazardous chemicals from the areas of destruction so that these areas could be properly and safely demolished. These areas are mostly residential properties and the County as well as FEMA supported a swift recovery to rebuild. Care Environmental mobilized within twenty-four hours of notice.